A short post today as as I’m tired. Last weekend I finished my Swiftclaws. Work in progress can be seen here and here. 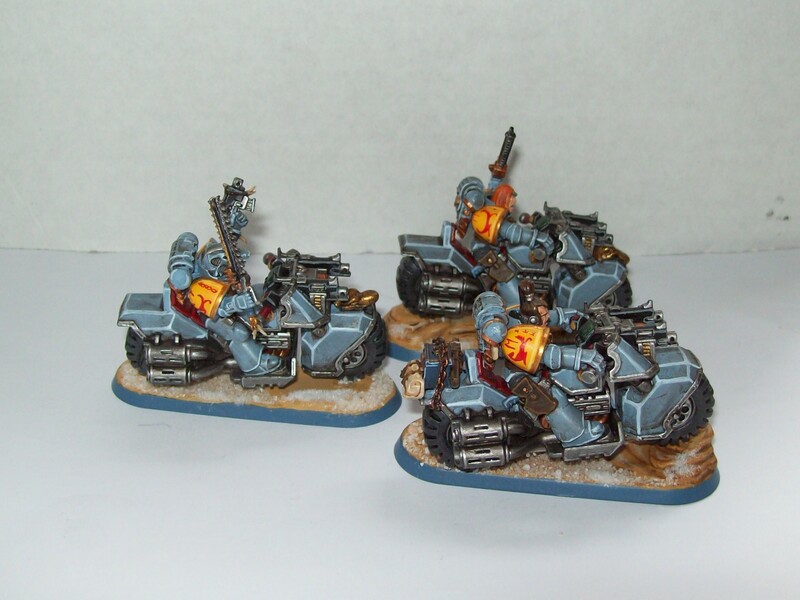 Currently I only have three bikers although the eventual plan is for a large squad with an complete with Wolf Guard or Wolf Priest leader to try and rein them in. 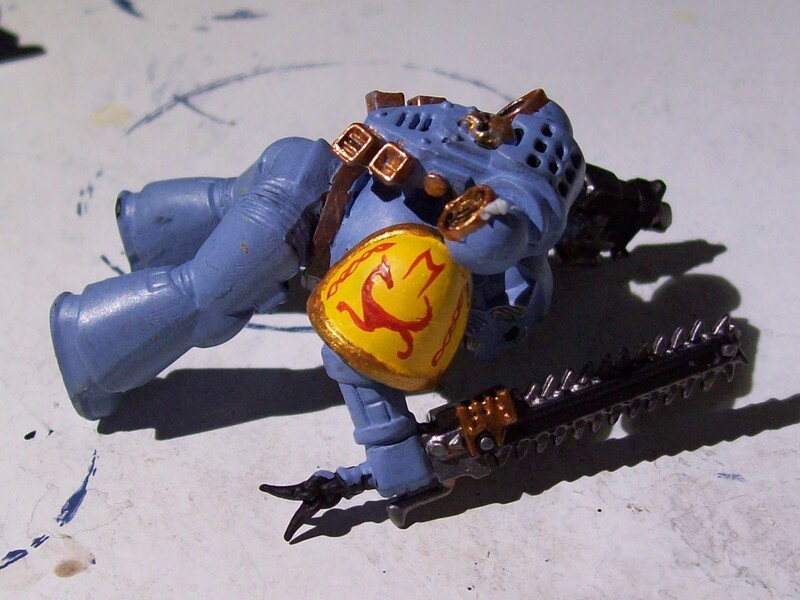 Parts were from the Ravenwing Bike Squad, the Space Wolves Pack, the Space Marine Scouts kit (the sheathed knife) and the Space Marine Devastator kit (the holstered pistols). 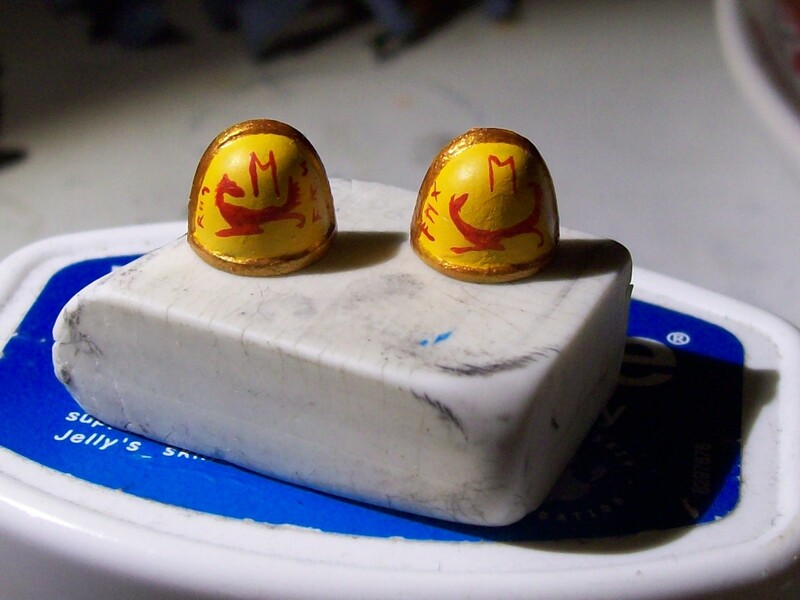 The bases were made using Milliput to build up rocks, which were then painted with a mix of Tausept Ochre and Bleached Bone. I then added bits of gravel using super glue. 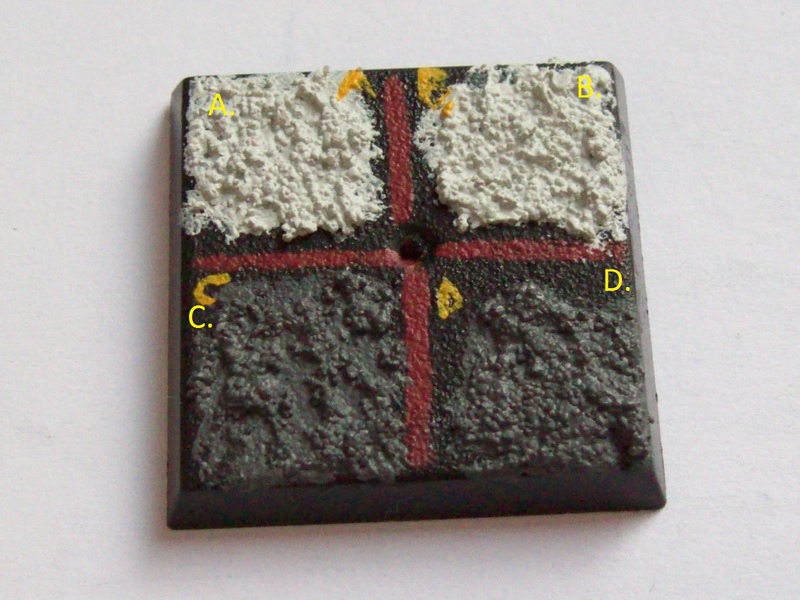 Finally I added a coating of sand followed by a patchy coat of snow (Citadel Snow) both attached using PVA glue. I probably need to add a bit more weathering to these guys some time but I want to do it properly so I’m leaving it until I know what I want to do. I’m really looking forward to using them in a game though, whenever I get round to having one! A couple of months back my boyfriend and I saw the Imperial Strongpoint in our local Games Workshop. It was just after the latest price increase but the sticky label on the front of the box still showed the old price so we thought we’d get one. Unfortunately that price was wrong but we still needed some scenery so we bought it anyway (and it’s hard to say no to the shop manager when he’s just tried to ring it through three times). Of course now it counts as a fortification, but it’s still something on the table that’s not a cardboard box or a wooden duck. The box is enormous, so big in fact that the shop manager had to cobble together a carrying handle for the carrier bag as it filled the largest bag in store and inside are rather a lot of sprues, enough to make two Imperial Bastions and an Aegis Defence Line. The box then sat in my apartment until Sunday when I decided that, yeah, I really should build it (and clear some space by getting rid of the box!). I looked at the instructions and panicked. Then I looked at them again and decided that they were no worse than the ones you get with flat pack furniture. So I decided to build the Bastion and record my progress. Despite the terrifyingly large booklet it’s mostly quite straightforward. To make it you need clippers, a file, a scalpel, plastic cement, a pin vice, a vice and maybe some bulldog clips or elastic bands (although I only used the former and then only once). First a note on plastic cement. I use Revell Contacta Liquid, but the same idea applies to all brands. To use plastic cement, place a line of cement on at least one of the surfaces you wish to bond, preferably both. Plastic cement works by melting the plastic (which is why it doesn’t work on resin or when you bond plastic with something else). By spreading cement on both surfaces you melt the top layer of both surfaces which makes a better bond. Sometimes it helps if you can agitate the join a bit, but that’s not always practical. The main thing you need to be with plastic cement is patient. In order to get a good bond you need to clamp both surfaces together, either with your fingers or with some sort of clamp/ an elastic band. It will bond nicely after a few seconds and set firmly after a couple of minutes. If you’re posing a model, you can alter the pose a bit after you’ve applied the glue, which can be very useful! To build the bastion you will need quite a lot of space, which is why I worked on the floor. As it’s such a big model I took the pieces off the sprue as I worked, so as not to mix up the pieces. Most of the bulk of the bastion is made up of a few big pieces. These are constructed in three stages, starting with the bottom layer. For this you need to first build the corner pieces and then, once you have all four ready, you need to glue them to the gun slit panels. I built mine up by connecting a corner to the right hand edge of a gun slit panel and waiting for the glue to set before joining two of these panels together (see picture below). Then, when these had set, I then joined together the two halves of the bottom layer. This makes it easier to control your corners! Once you’ve done that you can add a door. GW have been economical and provided one door with a different pattern on each side. 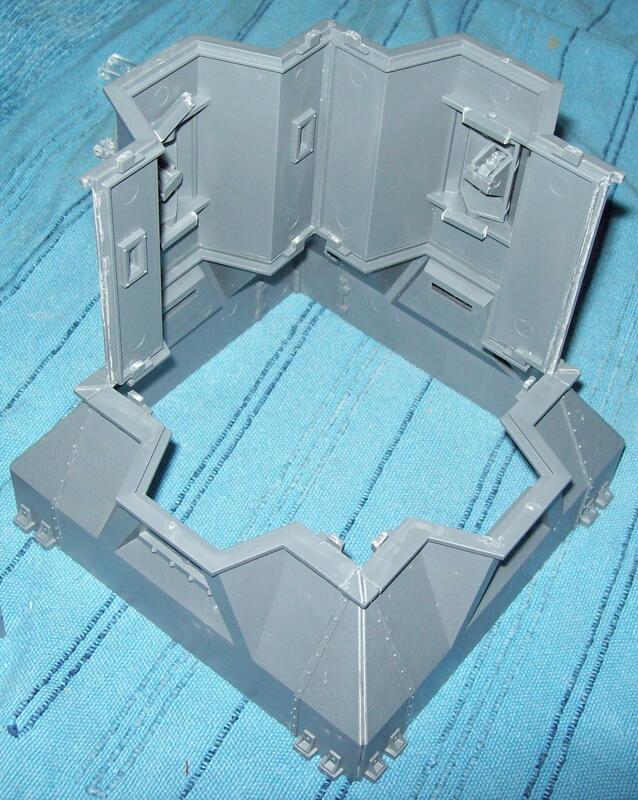 The next thing to do is build the heavy bolter emplacements for the next layer. Start by drilling out the barrels of the guns. There are only four of them and it does look better. You need a vice and a pin vice and a suitably sized drill bit. Place the bolt guns in the vice, barrel upwards. Mark the centre of the barrel and then simply drill down until just below the vents. I use a drill bit which is wide enough that the vents are also hollowed out, but if your bit is not wide enough it’s the work of seconds to clear the vents of excess plastic with a narrow drill bit. The plastic is quite soft so even if you don’t have a pin vice it’s possible to drill out the hole with just the loose bit (which I have to do with our thinnest bit as it’s too narrow for the pin vice). 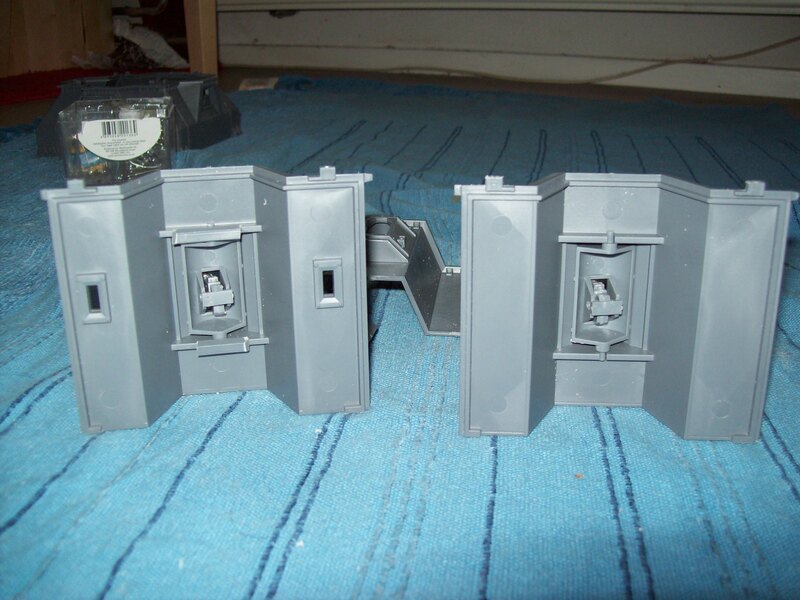 The next job is to assemble the gun emplacements. Place the pegs of the bolter in the mount on the emplacement. Place a little bit of plastic cement on the edge of the mount and on the back panel, taking care not to get any glue on the pegs. This means that the guns are movable, which I like. Next you need to put the emplacements in their windows. The emplacements clip into place. You can glue them there or, if like me you like to keep as many moving parts as possible actually movable, you can secure the pegs in place with a small piece of sprue. Next I glued together two of the four panels that make up the middle layer. This is where I deviated from the instructions given. Do not glue together all four pieces. The instructions say to do so, but if you do, you’ll have a LOT of trouble trying to force the two layers together as the pegs won’t sit properly. Gluing two panels together makes it easier to get the right angles right and then you can fit these pieces on top of the bottom layer quite easily and glue them together to finish the middle layer. The last part of the main bastion is the top layer. Start with the floor. This consists of two rectangular pieces and four trapezium shaped bits. Start by gluing together the two rectangles to make a square. Place this on top of the bastion. Then fit the trapeziums in place. Next fit the top wall sections on top one at a time. So having finished the structure of the bastion you then need to build the accessories. You can top it with either an Icarus-pattern lascannon or a communications array. Fortunately the kit comes with a couple of stands so, if you put one on your bastion, the other one can go elsewhere on your board. Both accessories are pretty straightforward to build. The lascannon is moveable. Glue together the stock (I used bulldogs clips here to make sure the stock glued together neatly) and clip the legs on the pegs. Then you can glue the legs to the base. Next you need to stick the barrel together and then glue it into the slot. Finally glue the vox, lamp and sights onto the cannon and then it’s done. The communications array looks complicated but it’s actually very simple. Everything has its own, uniquely shaped slot. All you have to do is glue peg a into slot b. 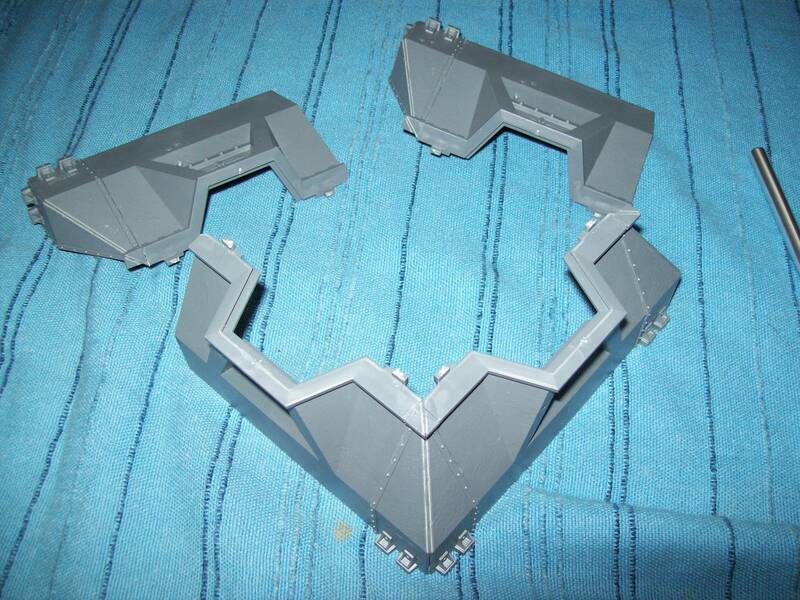 The stands are also very straightforward to put together, so I won’t go into them. The final thing to do is to decorate the bastion. 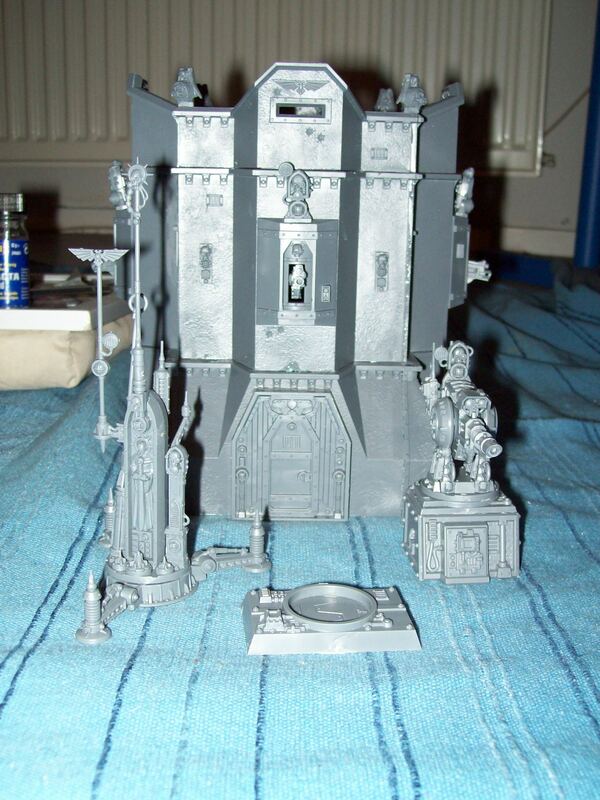 The kit comes with skull lamp/vox units, corner gargoyles and traffic-light-like lamps/voxes. 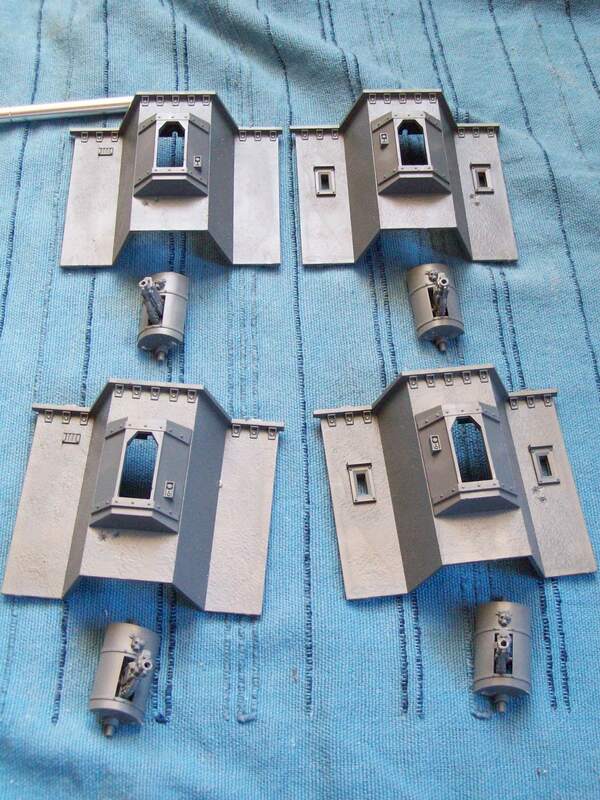 The manual suggests placing the standing lamp/vox units on top of the crenelations. However, the instruction writer seems to have forgotten that the top is bevelled so that the skulls won’t sit vertically. I placed them on top of the windows instead. Well that’s the bastion. I might see if I can get my boyfriend to build the other one as I think that this one took something between two to three hours to build. I wasn’t timing myself, but it’s a big job and I still have to paint it. In the next part of this series, which I hope to post this week, I’ll run through building the Aegis Defence Line. Eventually I hope that I can add a painting guide too but that might take a little bit longer! I bought myself some nail polish the other day. It was supposed to give a cracked effect and I suppose it did, although it resembled tarmac more than anything else unfortunately. I was a little annoyed at that, I don’t wear nail polish often, but I’d liked the idea and was rather annoyed that it hadn’t worked at all. Then I had an idea- it looked like tarmac on my nails, but how would it look on scenery? The nail polish adhered nicely to the plasticard. The stuff cracks as it dries. A thin coat makes small cracks, but a larger blob leads to larger cracks. This is the piece before priming. 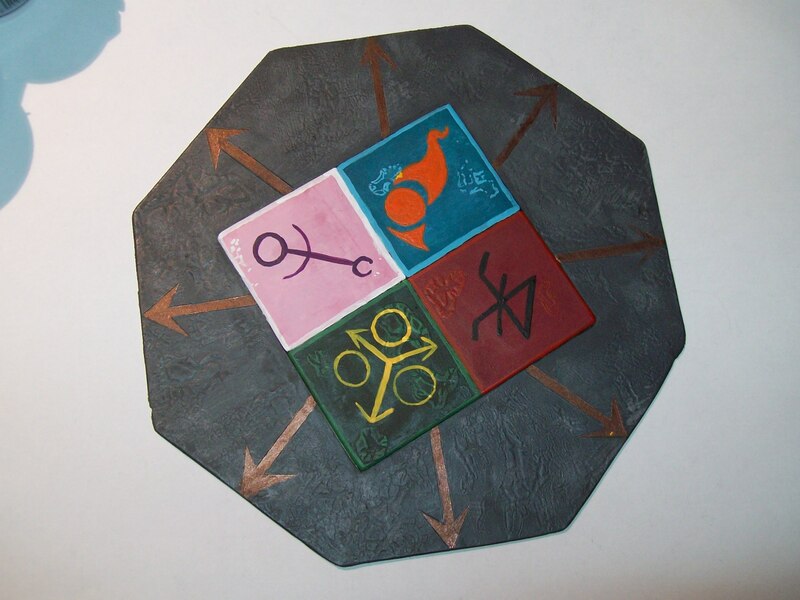 It’s part of a larger piece I’m planning, an objective marker that is a shrine to Chaos (my boyfriend plays Chaos Daemons but most of the scenery we have is Imperial (and unpainted)). I used Citadel Chaos Black spray to undercoat the piece and then I painted it. This is the result. I bought the nail polish from a Dutch store (Etos), but you could probably find it elsewhere. The shop doesn’t sell it online, so I can’t link to it, but Boots do something similar. It’s a very easy way to effectively create texture on a piece of scenery. Work has just got very busy so I’m not going to have time to write much of a post today. Here are my current works in progress though: shoulder pads for my Swiftclaws. I’m afraid they’re still in progress so they’re not all neat and tidy yet (and the guys themselves are most definitely scruffy) but I had a bit of fun thinking up the design last night. It’s supposed to be of a wolf with the rune “Ehwaz” above it as “horse” was the closest rune I could think of to “fast”. I tried to make them look as if they were running, but vaguely animal like was difficult enough in the end. Hopefully I’ll have time to finish these guys this weekend, but I don’t think I’ll have much free time for the next couple of days with which to work on them, which is a pity as I’m finding them really enjoyable to paint. It’s rather warm here at the moment. I know that 30°C is probably not that hot really, but there’s no breeze and old Dutch houses don’t have air conditioning, or at least my apartment doesn’t. 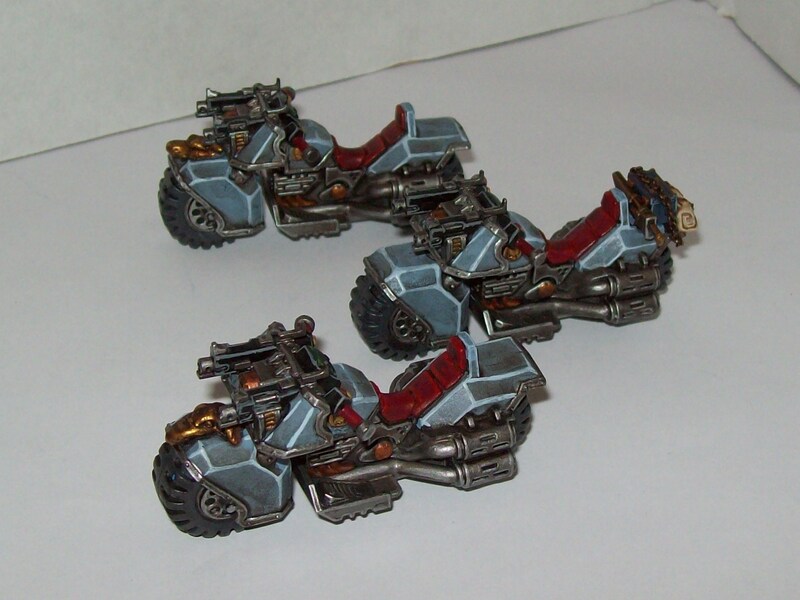 Its warm enough that the paint is drying on my palette faster than I can use it, which is a problem as I’ve just had a 3 ½ day weekend and I wanted to finish my Swiftclaw bikers. I did finish the bikes but the riders are all still just blue-grey blobs. 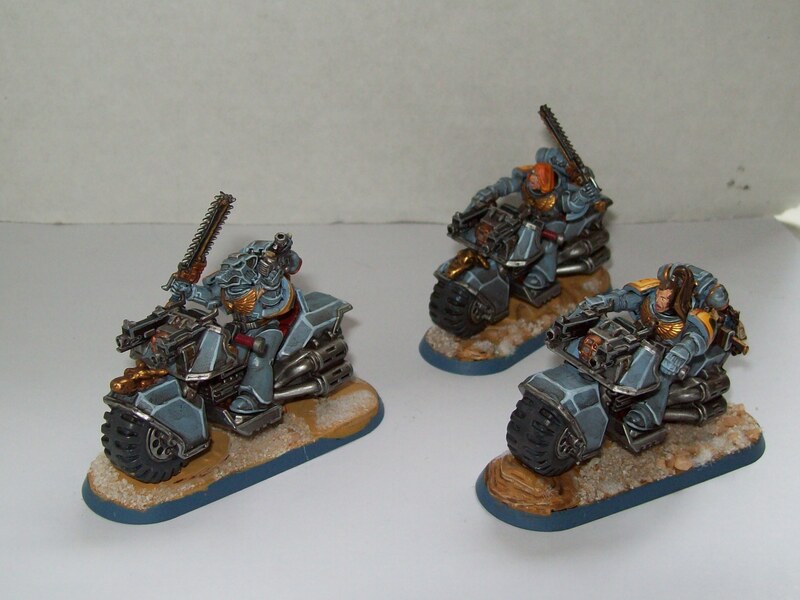 The bikes are from the Ravenwing bike kit. I’ve used green stuff to sculpt the wolf heads on the front of two of the bikes and the knife or sword on the back of the third came from the Space Marine Scout box. Anyway, this is what they look like at the moment sans riders. Hopefully I can get the riders done and the models based before too long! I have to be honest, the Citadel Texture paints didn’t really interest me when the new line of Citadel paints came out earlier this year. My boyfriend on the other hand thought that he might find them useful for basing his models, so I ordered a pot of Astrogranite for him. Then I was recommended the Mourn Mountain Snow and thought that I’d give it a go. I wasn’t overly impressed by it the first time round to be honest, it looked a bit, well, odd. I thought that I should give it a bit of a chance though, so I decided to run a test. I’ve not gone much out of my way for this review, I’m afraid, as I’m just testing the two Texture paints we have: Mourn Mountain Snow and Astrogranite. I prepared the square base by priming it with two coats of Imperial Primer. I then divided it into four quarters. On one half I used Mourn Mountain Snow, on the other I used Astrogranite. I used a both a brush and the scoop part of the Citadel modelling tool to apply both paints. The paints themselves consist of some sort of grit or sand suspended in thick paint. The paints are largely odourless and washed off the brush easily. They have a jelly-like texture, unlike the normal Base and Layer paints, and this makes them a little difficult to apply by brush. I have to confess that I think that Astrogranite looks a bit better than Mourn Mountain Snow. 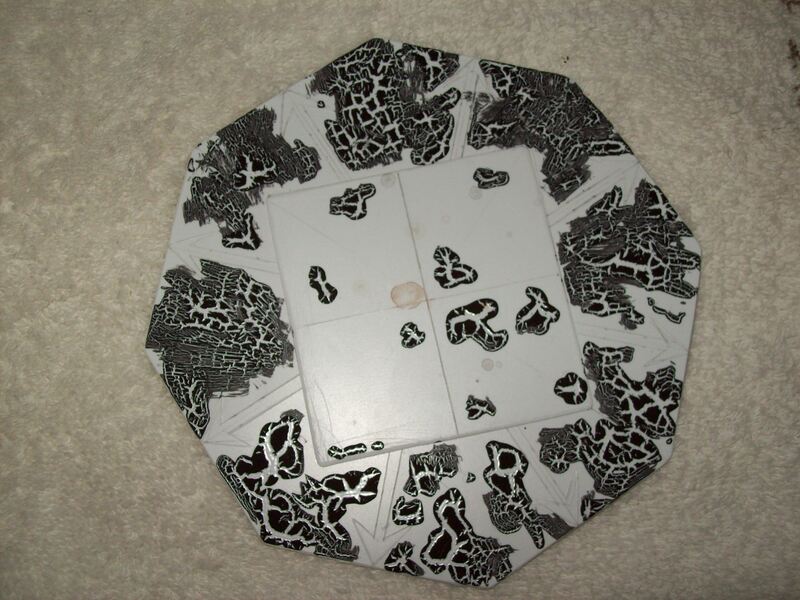 It would work either as a layer across the whole base, or in blobs to add features to a base. It would be quite good for a gravelly urban base or combined with some green flock to resemble the verge of some country road. I think that Mourn Mountain Snow would be most effective on scenery, particularly scenery that might get bashed around, when flock is less suitable. It might look good used in conjunction with either Astrogranite or Stirland Mud to make a snowy urban- or battlefield- style scene, where the snow and the gravel and mud all combine to make a slushy mess. I don’t suggest mixing the paints, rather using splodges of several different Texture paints on the same base. If you’re lazy about basing, or dislike it, or are very pushed for time, these paints offer a way to get properly based models quickly and without too much fuss. In conclusion, while I still can’t think of many reasons why I’d personally want to use the Texture paints, they do work quite effectively. Mourn Mountain Snow is slightly less effective than Astrogranite, but both have potential to speed up basing if you’re not so keen on that part of the hobby. A potentially useful product, if limited by the use of the same texture medium in both paints tested. I was going to try and get a game in this weekend, but I failed miserably. I did make some inroads into the modelling pile though. I’ve begun basing some models that have been waiting far too long for a splash of paint and some gravel and I’ve sprayed primer on the rest of the box of barricades I bought at the beginning of the year. I even got the Imperial Strongpoint out of its box and promptly put it back. That thing is massive! I need to clear the table completely before I start work on it. The thing I’ve spent most time working on though has been my first three Swiftclaw bikers, largely because they’re great fun! I am really enjoying building and painting them (and running them along the table going vroom vroom). They’re not yet at the stage where I can post pictures as I’m still at the block colour stage but I thought that I should try and post something tonight. They’re going fast enough that I might have one ready this week, which will be very nice and there will definitely be posting of pictures then. I’ve been planning these guys for far too long now, it’ll be nice to actually use them in a game. Sorry for the short post, there will be some longer ones coming soon.